It has been a few weeks since my last post and a lot has changed in that time. Regular readers are probably aware that I live and work in the Boston area, and anyone who has been near a television in the past week or so is surely aware of what happened between the marathon on Monday and the manhunt on Friday of last week. I was very fortunate to have been only indirectly affected by the bombing and its aftermath, but it was a very disruptive event in the lives of everyone in and around the city of Boston. Life is getting closer to normal every day, though, and part of that return process is getting back to the things we love to do. Tasting and writing about unusual wines is probably not all that important on a cosmic scale, but it is important in my own life and I hope it means at least a little to those who read regularly or sporadically. In that spirit, it's time to get back to the weird grapes by taking a little trip to Slovenia to try the Pinela grape. Though today's wine is from Slovenia, it is thought that Pinela (under the name Pinella) is originally from Italy. It is first mentioned all the way back in 1324 in the Catalogo delle varietà delle vitis del Regno Veneto, where it was said to be used in the wines of Udine, Friuli. It should be mentioned, though, that some sources (here and here) indicate that Pinela is actually indigenous to Slovenia, and, further, that there hasn't been any DNA analysis done to see whether the Pinella of Friuli and the Pinela of Slovenia are actually the same grape. It seems reasonable to assume that the two are the same, since the region of Friuli borders Slovenia and many of the Slovenian regions where Pinela can be found. Both Wine Grapes and the VIVC list the two grapes as synonyms, and that's good enough for me right now. Whatever the case may be, Italy claimed 72 hectares of Pinella in their 2000 agricultural census, while Slovenia claimed 50 hectares of Pinela (or sometimes Pinjela) in their 2009 census. The grape does not appear to be grown anywhere else in the world. Slovenian wines are somewhat difficult to find on American shelves, but they've been growing vines and making wines in Slovenia for a very long time. The Celts and Illyrians were making wine in the area known as modern-day Slovenia long before the Romans began introducing viticulture into the areas where France and Germany are now found. Slovenia's history is turbulent, as the area has been conquered and occupied by a number of different European powers throughout its history. It was a part of the Austro-Hungarian Empire until World War I, when the new State of Slovenes, Croats and Serbs broke away and formed their own country. In 1928, this state merged with Serbia and in 1929, the country was renamed the Kingdom of Yugoslavia. Yugoslavia was invaded by the Axis powers in 1941 and control was divided between Germany, Italy and Hungary until 1945, when the Axis powers were defeated by the Allies. After World War II, Yugoslavia became a communist state. Though not as restrictive as many of the other eastern-bloc communist governments, being a communist state had detrimental effects on the development of the wine industry. Josip Broz Tito was the leader of communist Yugoslavia until his death in 1980, at which point the political and economic climate of the region began to become less stable. In 1987, a group of Slovene intellectuals publicly began to call for Slovenia's independence from Yugoslavia and a movement towards democratization began in earnest. Several democratic amendments were passed in 1989, and in 1990, the Slovenian assembly changed the name of their region to the Republic of Slovenia. Later that year, 88% of the Slovenian electorate voted for a sovereign and independent Slovenia and the country became independent officially on June 25, 1991. The Yugoslav People's Army sent troops into the region on June 27 of that year and on July 7, a treaty was signed that ceased hostilities in the region. A new constitution was adopted in December of 1991 and the EU recognized Slovenia as an independent state in January of 1992, with the United Nations following suit in May of that year. **UPDATE** An anonymous commenter has informed me that my understanding of post WWII, cold war era politics is a bit mistaken in the paragraph below. He/she says the following: "Just one note: Yugoslavia (including Slovenia), was not behind the iron-curtain. Yes, it was communist, but not part of the USSR controlled Warsaw-pact... What it meant in practice, was that free travel of people and goods was permitted and as such your statement incorrect that their position was like Romania, Hungary or Georgia. The first two were separate states behind the Iron Curtain, the latter was actually part of the USSR. As we've seen with Romania and Georgia, spending time behind the Iron Curtain throughout the latter half of the 20th Century means that you were essentially isolated from the western World. There was not a lot of movement of ideas or commerce between communist and democratic nations. The former Soviet bloc countries have had to make up a lot of ground in a very small amount of time in order to carve out a presence in Western markets. The former Yugoslav republics and countries like Hungary have had a little bit better time of it because they are geographically closer to western Europe, making tourism easier, and because they were never as dependent on the USSR and post-Soviet Russia as countries like Georgia were. The degree of success that a given country has had following the end of the Cold War is, perhaps unsurprisingly, related to how well the country was functioning throughout the 20th Century, and while all of the former communist dictator states have had to play a bit of catch-up, some, like Slovenia, were better prepared and in a better position than others to do so relatively quickly. All of which brings us back to Slovenian wine in general. Slovenia is just south of Austria, just east of Friuli in Italy, just north of Croatia and just west of Hungary. There are three major wine regions in Slovenia. Primorje is located in the western part of the country, just over the border from Italy, and this is where most of the wines that we see on US shelves come from. Brda is perhaps the most well known region within Primorje, but there is also Collio Goriziana (which is partly in Slovenia but which can be bottled as an Italian DOC), Koper and the Vipava Valley, where today's wine hails from. The other two major wine regions of Slovenia are located on the other side of the country with Podravje in the northeastern corner and Posavje in the southeast. Podravje (Drava Valley) is the largest of the three major regions of Slovenia and is known primarily for the production of white and sparkling wines. Posavje (Sava Valley) is the only major region to produce more red than white wine (as a nation, Slovenia's output is about 75% white), but much of the production here is of the bulk variety. I was able to get my hands on a bottle of the 2008 Batič Pinela (100%) from the Vipavska Dolina region of Slovenia (map here). I bought the wine from the always excellent Blue Danube Wine Company for around $29. The first bottle that I ordered was corked, but Blue Danube quickly sent me a replacement. 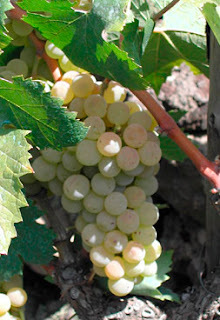 Pinela is a white grape, but this wine is made in an orange wine style, as the grapes are crushed and left to macerate on the skins for five days without any temperature control. Natural yeast fermentation is followed by 24 months of aging in old Slovenian oak barrels. The wine is bottled unfined, unfiltered (usually) and with minimal SO2 additions in the funky vessel seen at right. In the glass the wine was a medium golden bronze color. The nose was fairly intense with aromas of dried apple, cider, pear, dried leaves, hay, autumn spice and bergamot. On the palate the wine was on the fuller side of medium with fairly high acidity. There were flavors of dried leaves, dried apple, autumn spice, hay, orange peel and toasted nuts. It clocks in at 14.5% alcohol and does wear it a little clumsily, but overall it was an absolutely wonderful wine. It's warm and spicy with a great autumn vibe that would be deliciously appropriate at Thanksgiving, but which I'd be happy to enjoy any time. It is best served no colder than cellar temp and in the company of valued family and friends. One of the things that I really love about digging into some of these unusual grapes is learning how many of them are related to one another. 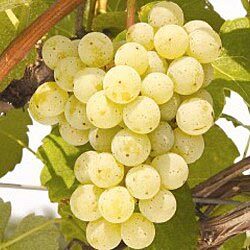 For instance, I knew today's grape, Cayuga White, was a hybrid, but I didn't know anything about its parents or grandparents. I learned that it is the offspring of a Seyval Blanc x Schuyler crossing, which is kind of cool because I'm a little familiar with Seyval, but I didn't know anything about Schuyler. It turns out that Schuyler is itself a crossing of Zinfandel and another hybrid grape known as Ontario (which is a crossing of Winchell and Moore's Diamond). Which means that Cayuga is the offspring of Seyval Blanc, the grandchild of Zinfandel and the great-grandchild of Moore's Diamond, three very different grapes! As with human beings, one can get into trouble expecting family members to closely resemble one another. Cayuga bears virtually no resemblance to Zinfandel, and though it can occasionally pick up some foxiness if allowed to over-ripen, it doesn't bear much resemblance to Moore's Diamond either. Interestingly, the two grapes that Cayuga is most often compared to are Riesling and Muscat, neither of which figure into its family history. Like Riesling and Muscat, Cayuga is often made into an off-dry or medium sweet wine, though it also makes interesting sparkling wines if harvested early enough. It is most heavily planted in New York state, where it covers just over 400 acres, but can also be found in the American Midwest and to a more limited extent in the northeastern US and southeastern Canada. Cayuga was created in 1946 at the New York State Agricultural Experiment Station in Geneva, New York, by John Einset and Willard B. Robinson. It was selected from other seedlings in 1952 and was finally released in 1972 as "the first of a Finger Lakes series of wine grapes for New York." Cayuga was successful because it buds late and ripens early, which cuts off the extreme ends of the growing season. It is a heavily productive and vigorous vine that benefits from a discouraging hand in the vineyard. In fact, in 1964, a "25 variety trial" was undertaken to test the "most commercially promising American and French hybrid varieties and six new Geneva selections." The 25 selected vines were planted on three different sites in New York and various statistics were gathered about them over a period of several years. One of the statistics was total yield and Cayuga outperformed all of the other grapes in the trial in that category. It has decent disease and fungal resistance, but only moderate cold-hardiness, which has prevented it from becoming more popular with growers. I was able to try two different wines from the Cayuga White grape. The first was a NV wine from Jewell Towne Vineyards in New Hampshire. Jewell Towne is the oldest winery in New Hampshire, though they only opened in 1994. The owner, Peter Oldak, has been growing grapes on the property since 1982, when he planted six vines on a hobbyist lark. By 1990, he was growing over 60 different varieties and decided to teach himself how to make wine. He made a few vintages for other wineries but decided to open his own winery in 1994. His debut vintage was only 40 cases which sold out in three weeks. Today, Jewell Towne produces over 7000 cases per year and is really the first name in New Hampshire wine today. I picked this wine up at a state store in Nashua for around $12. In the glass the wine was a very pale silvery lemon color that was almost water-white. The nose was moderately intense with aromas of peach, grapefruit, pineapple, pear and cheese. On the palate the wine was light bodied with medium acidity. It was medium sweet with flavors of mandarin orange, pineapple candy, pear, white peach and golden apple. It finished short and with a bit of bitterness. It was a fairly nice wine for the money, but wasn't anything too memorable. The second wine that I tried was the 2011 Ravines "Keuka Village," which is 80% Cayuga and 20% Vignoles. Ravines is located on Keuka Lake in the Finger Lakes, but I picked this up locally at the Spirited Gourmet for around $13. In the glass the wine was a deep gold color. The nose was moderately intense with aromas of honey, green apple, pear, apricot and orange marmalade. On the palate, the wine was on the fuller side of medium with high acidity. It was off-dry with flavors of green apple, lime, honeysuckle flower, orange peel, white grapefruit and pineapple. It was bright, tart and zippy, which surprised me a little because the nose really smelled sweet and I thought this was going to be a syrupy mess. It was nice and citrusy, though, and I could definitely see why someone might want to compare this wine to a kabinett level Riesling. It was nicely aromatic and fairly well balanced, which is a pretty nice combination in a sine under $15. Last week, I started a new series called Know Your Malvasia where I take a look at different Malvasia-named grapes and explain where they're grown and how they do or do not relate to other Malvasia grapes. Today I'd like to expand that concept a little and start to talk about the various Lambrusco-named grapes. There is a lot of bad information out there about Lambrusco grapes and over the next few weeks, I'd like to try to set as much of it right as I can, starting with the Salamino grape today. The two most common bits of misinformation regarding the Lambrusco grapes are pretty much the same as for the Malvasias. Some people will tell you about the Lambrusco "family" of grapes, while others will tell you that the various Lambruscos are made from "sub-types" or "sub-varieties" of a single Lambrusco cultivar. The people that tell you this are wrong. A study done in 2005 (citation 1 below) analyzed most of the Lambrusco-something cultivars grown throughout Emilia-Romagna and while they found first degree (parent/offspring) relationships between a few of the grapes in the study, pretty much none of the major of Lambrusco cultivars were found to be that closely related to one another. Which isn't to say that they aren't related at all. When the team analyzed genetic similarities for all of the grapes in the study, they did find that most of the Lambrusco grapes clustered together, indicating that they probably share a common ancestor at some point along the line, but how distant that relative might be is difficult to say. As we learned in my last Know Your Malvasia post, there really is no such thing as "sub-varieties" of grapes. But one might wonder, if there isn't any direct familial relationship and if they aren't "sub-varieties," then why do they all have the same word in their name? The word "Lambrusco" means "wild grape" in Italian, and it was long thought that the Lambrusco grapes were domesticated from wild vines around Emilia-Romagna. A study done in 2009 (citation 2 below) analyzed many wild grape varieties in Piemonte and compared their DNA with several Lambrusco varieties as well as several other cultivated grape varieties of the region. 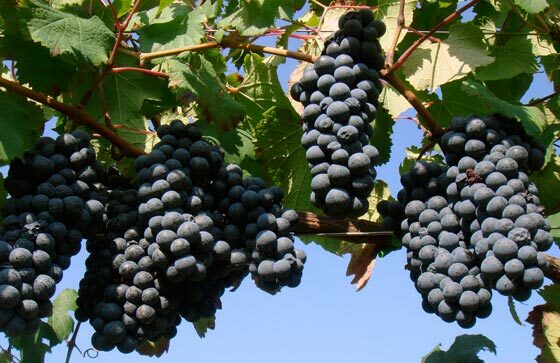 They found that the Lambrusco grapes had more DNA in common with the wild grapes than the other cultivated varieties, indicating that they were more closely related to the wild vines and may have been domesticated more recently. It's worth noting that here in the United States, when we think "wild vines" we think of Vitis labrusca or some of the other "foxy," native American varieties. In Europe, the situation is a little bit different. Wild vines in Europe are still Vitis vinifera, but there is actually a sub-species of the vinifera species called sylvestris. Please note, this is a sub-species, not a "sub-type" or "sub-variety." Vitis vinifera subsp. sylvestris is differentiated from Vitis vinifera subsp. vinifera mainly by the fact that vinifera flowers are hermaphrodites, meaning that they have both male and female organs and so can pollinate themselves, while sylvestris flowers are dioecious, which means that some flowers are male and produce pollen while others are female and need to receive pollen from males in order to produce fruit (unpollenated flowers just fall off a vine and die, while pollinated flowers produce berries). One can easily understand why hermaphroditism was selected for by early farmers, since the ability to self-pollinate produces a more reliable and a larger crop. Interestingly, there are a handful of Vitis vinifera subsp. vinifera vines that are not self-pollinating, but which are not necessarily dioecious. Lambrusco Sorbara, for example, only has female flowers, so it must receive its pollen from other vines. As a result, Sorbara is often inter-planted with Lambrusco Salamino so that the Salamino pollen can pollinate the Sorbara flowers. What all this means is that though many of the Lambrusco grapes may be distantly related to one another, they're not exactly a "family." Furthermore, they are all separate grape varieties and are not "sub-types" of any single Lambrusco grape. So how do you know which Lambrusco grape you're drinking? Like Malvasia, it often depends on where you are. Some of the Lambrusco grapes are easy to spot, since their names are typically printed right on the label. Lambrusco di Sorbara is made from the Sorbara grape, while Lambrusco Grasparossa di Castelvetto is made from the Grasparossa grape. Lambrusco Salamino can be found in the Lambrusco Salamino di Santa Croce DOC wines, but can also be found in basic Reggiano DOC wines as well as the wines of Lambrusco Mantovano and the Colli di Scandiano e di Canossa. You can always check the DOC regulations for the region of wine that you're drinking, but if there are many different varieties authorized for use or if your wine is labeled as IGT, then you may just have to live with the mystery. Lambrusco Salamino is the most common of the Lambrusco varieties and is planted on over 10,000 acres of land (mostly in Emilia-Romagna, though a little bit is surprisingly found in Sardinia). The name "Salamino" comes from the fact that the grape bunches are long and cylindrical and thus thought to resemble little sausages, or "little salamis." There are at least five different clonal variants of Salamino that are recognized by ampleographers: tender, red-leaved, green-leaved, red-stalked, and green-stalked. Salamino grapes are naturally very high in sugar and so they lend themselves to the production of sweet and off-dry wines, though bone-dry wines made from the grape are also widely available. The berries are deeply colored and can provide quite a bit of tannic grip to the finished wine, and Salamino-based Lambruscos are typically heavier-bodied and more aromatic than those from other Lambrusco grapes. For those who might object that Lambrusco is far too common for me to write about here, I would counter by saying that the first of the three Salamino-based wines that I'll be reviewing is actually a Lambrusco Bianco, which is made from 100% Salamino grapes that were crushed and rapidly moved off the skins before picking up any coloring, as in a Blanc de Noirs Champagne. The wine was the NV Lini 910, which I picked up from my friends at Curtis Liquors for around $16. In the glass the wine was a fairly pale silvery lemon color with nice frothy bubbles. The nose was fairly intense with aromas of toasty bread, apple, green apple candy, toasted nuts and a touch of raspberry. On the palate the wine was medium bodied with high acidity. There were flavors of toasted nuts, toasted bread, ripe apple, pear, fresh cut lemon and lemon peel. The fruits were a bit subdued, but there was a lot of secondary fermentation aromas and characteristics that were quite nice indeed (which is interesting, since this is a tank-fermented wine). I found the wine both interesting and delicious and thought that it was a really great value for the money. I also had the opportunity to taste Lini 910's regular Lambrusco bottling ($17), which their website says is 85% Salamino and 15% Ancelotta, which is a common Lambrusco blending grape that tends to soften the tannic edges of other grapes and round out the flavor profile a bit. In the glass this wine was a fairly deep purple ruby color with lots of fizz. The nose was fairly intense with aromas of blackberry and black cherry fruit along with grape soda and leather. On the palate the wine was medium bodied with fairly high acidity. It was dry with flavors of black cherry, blackberry, cola, grape soda and a touch of smoky charcoal. It was very fresh and very fruity, but also dry and very refreshing. This wine is also tank-fermented, and I definitely think it helped to accentuate the fresh fruit flavors. I had this wine with an Italian cold-cut calzone, and it was absolutely perfect, cutting through the oily meats while also standing up to and complementing the tomato sauce I was dipping into. A few months ago, I wrote about a wine being imported by my friend Matt, who is a co-owner of the Wine Bottega in the North End of Boston, and his new company Selectio Naturel. Matt brings in wines from all over Italy (and some from France too), and he has a handful of really killer Lambruscos in his portfolio. One of them is the 2010 Fondo Bozzole "Giano," which is made from 100% Salamino grapes ($18 at the Bottega). In the glass this wine was a deep, inky ruby-black color with bright purple fizz. The nose was moderately intense with aromas of grape soda, black-berried fruits, dark chocolate, cocoa and char. On the palate the wine was medium bodied with fairly high acidity. It was dry, but absolutely loaded with blackberry and black cherry fruits and dry grape soda flavors as well. There was a savory edge to the wine as well and I thoroughly enjoyed it with some ground-turkey lasagna. It is versatile enough to pair nicely with a variety of foods, but is also delicious enough to just drink on its own. 1) Boccacci, P, Marinoni, DT, Gambino, G, Botta, R, & Schneider, A. 2005. Genetic characterization of endangered grape cultivars of Reggio Emilia province. American Journal of Enology and Vititculture, 56(4), ppl. 411-416. 2) Schneider, A, Marinoni, DT, Raimondi, S, Boccacci, P, Gambino, G. 2009. Molecular characterization of wild grape populations from north-western Italy and their genetic relationship with cultivated varieties. Acta Horticulturae, 827, pp. 211-216. When I was a kid, I used to love reading about Greek mythology. The Gods and their stories were so interesting to me and I used to love to imagine what it must have been like for them on Mt. Olympus. 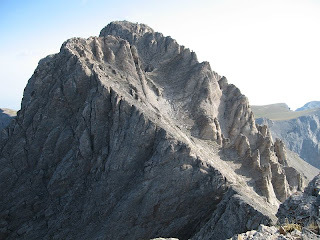 When I got a little older, I was surprised to learn that there was an actual Mt. Olympus in Greece, as I had always assumed it was just some made up place. It is the highest mountain in Greece and actually has 52 peaks, the highest of which is called Mytikas (pictured at left). Mytikas reaches a height of 9,570 feet, which makes it about 1/3 the size of Mount Everest, whose highest point is nearly 30,000 feet tall. I'm pretty sure they don't grow grapes or make wine around Mt. Everest, but they do around Mt. Olympus, and I'd like to take a look at a wine from this area today. Mt. Olympus is located on the border between the Greek regions of Thessaly and Macedonia in eastern Greece. Just to the southeast of Mt. Olympus, there's a region called Rapsani which, perhaps unsurprisingly, surrounds a village called Rapsani which was founded in the late 15th Century (possibly from Greeks heading into the mountains to escape the Ottoman invaders). Both the wine-growing region and the village of Rapsani are located in the foothills of Mt. Olympus, but not all of the vineyards are at altitude. There are fertile valley floors from sea level to about 100 meters where the legal harvesting limit of seventy hectolitres per hectare is frequently exceeded. As you might expect, these vineyards tend to produce the least exciting wines. From about 100 meters to 200 meters, the soil type changes to loess, which is a dusty, sandy kind of soil. These vineyards are also fairly high yielding and rarely exciting. At higher elevations, the soil type changes again to a rocky schist and the cooling effect of the altitude starts to have a more noticeable effect on the acidity in the grapes. The highest quality wines are made from these higher vineyard sites. Rapsani is the only region in Thessaly that is authorized to make red wines. The local regulations state that the red wines of Rapsani must be made from equal parts Xinomavro, Krassato and Stavroto. We've taken a look at Xinomavro before, so interested readers should check out that post for more information on that grape. Most Xinomavro in Greece is grown at more northerly latitudes, and Rapsani is one of the southernmost outposts for Xinomavro in Greece. Stavroto, on the other hand, is typically found a little further south than Rapsani, though still mainly in the region of Thessaly. In The Wines of Greece, Konstantinos Lazarakis describes Stavroto as "difficult to grow," and remarks that "by the time the grapes have reached 11.5 degrees Baumé it is usually half-rotten." It is lower in sugar, acidity and color than either Xinomavro or Krassato, and Lazarakis remarks that "it is doubtful whether Stavroto imparts any meaningful elements to Rapsani." Stavroto is also known as Ampelakiotiko Mavro, or "black from Ambelakia village," which is just southwest of the village of Rapsani, but most authorities, including Miles Lambert-Gócs (in his The Wines of the Greece), believe that Stavroto originated in Euboea, an island off the coast of Thessaly further to the southeast. Of the three grapes used for Rapsani wines, only Krassato is thought to be native to the region. Lazarakis describes Krassato as "relatively deep in colour...high in sugar and rich in dry extract," though Robinson & Co. temper this description in Wine Grapes by noting that Krassato has only moderate acidity and tannins and thus isn't conducive to extended aging. Which isn't to say that Rapsani wines don't age well. Xinomavro is rich enough in acidity and tannins that it contributes good structure to the finished wines even when it only makes up 1/3 of the final blend. The name Krassato comes from the word krasáto, which means "wine-colored," according to Lambert-Gócs. Like Stavroto, Krassato is mostly found in and around the area of Rapsani, though there are limited plantings just north and south of the region as well. Unlike Xinomavro, Stavroto and Krassato are almost never made into varietal wines, since both grapes have flaws that usually need blending to even out. Further, many of the vineyards of Rapsani have all three vines planted together throughout their vineyards, making varietal wine production especially challenging. I was able to pick up a bottle of the 2008 Rapsani Chrisohoou from my friends at the Spirited Gourmet for around $17. In the glass the wine was a fairly light purple ruby color (I also have it described as deep lavender in my notes, so pretty much a deep light purple, if that makes any sense). The nose was fairly intense with aromas of wild strawberry, raspberry, tea leaves, and dusty wood. On the palate the wine was on the fuller side of medium with medium acidity and light tannins. There were flavors of stewed strawberry, wild raspberry, tart plum, red cherry, black tea and chocolate. It was a soft, smooth wine with lots of zippy red fruits balanced by some earthy tea and chocolate notes. Wines featuring the Xinomavro grape can be lean and austere (particularly in their youth), but the addition of the other two grapes to this blend really rounds out the flavor profile. It's a great food wine that would pair well with lighter meat dishes in fruit sauce. It may not be the wine of the Gods, but it's certainly a wine that I think Bacchus would approve of from his perch on nearby Olympus. Given that there are several thousand different grape varieties used for commercial wine production, I'm sure that everybody has a few that they are always getting confused. I know that I personally have a lot of trouble keeping all of the Italian Ver-word grapes straight (Vermentino, Verdicchio, Vernaccia, Verduzzo and probably many more). I also find myself struggling with Vespaiola and Vespolina, Albarola and Albanello, and today's grape, Carricante, and Catarratto. Carricante and Catarratto are especially troublesome for me because both are white grapes that are found almost exclusively on the island of Sicily, though Catarratto is much more common than Carricante (Catarratto covers more than 100,000 acres in Sicily while Carricante manages a scant 250 or so). I'm apparently not the only person with this problem, as Carricante is often erroneously called Catarratto in some parts of Sicily, though the grapes are definitely different cultivars and are not even related. There's not a lot of things to say about Carricante, but I've summarized what I've found below and also have a review of a wine made mostly from Carricante with a little Catarratto thrown in for good measure. Catarratto tends to be found on the western end of Sicily, in the heart of traditional Marsala country, while Carricante tends to be found around Mt. Etna in the east. Carricante is thought to be native to the area of Viagrande, which is just southeast of Mt. Etna, and early written records indicate that Etna vintners used to barrel-age Carricante wines on their lees so that malolactic fermentation would kick in and soften the wines sharp acidic edge. The name Carricante may be derived from the word carica, which means "load," because the grape is apparently a fairly prolific yielder. If that is the case, then it seems odd that there isn't more Carricante planted, as wines made from the grape are increasingly recognized for their quality. A paper published in 2010 (citation 1 below) found that Carricante's parents were two grapes called Montonico Pinto and Scacco, neither of which are familiar to me. The Etna Bianco DOC requires that wines be made from at least 60% Carricante, though Etna Bianco Superiore requires 80% (and the grapes must come from Milo). Though I've never seen a wine made from Carricante outside of Sicily, the Italian agricultural census of 2000 reported 650 acres of Carricante throughout Italy, though only 250 of them are in Sicily. I do now know where they are hiding the other 400 acres or so and would be interested in hearing from any readers who have come across this grape on the Italian mainland. I was able to find a bottle of the 2009 Graci "Quota 600" from Mt. Etna in Sicily, which is a blend of 70% Carricante and 30% Catarratto. Carricante is typically blended with other Sicilian grapes, though varietal wines can be found as well. I picked this wine up from my friends at the Wine Bottega for around $35. In the glass the wine was a fairly light lemon gold color. The nose was moderately intense with aromas of fresh cut lemon, green apple and river stones. On the palate the wine was medium bodied with fairly high acidity. There were tart, racy flavors of lemon and lemon peel, green apple, pear and a really intense stony minerality. There wasn't a lot of complexity to this wine, but there was a lot of intensity. It was really heavy on the citrus and stony minerals, and I really enjoyed drinking the wine, but the steep price tag is a little difficult to justify for what you get. My bottling also had a minor cork failure with some seepage around the cork, but I don't think that it threw the wine off in any way. Cipriani, G. et al. The SSR-based molecular profile of 1005 grapevine (Vitis vinifera L.) accessions uncovers new synonymy and parentages, and reveals a large admixture amongst varieties of different geographic origin. 2010. Theoretical and Applied Genetics. 121: 1569-1585.